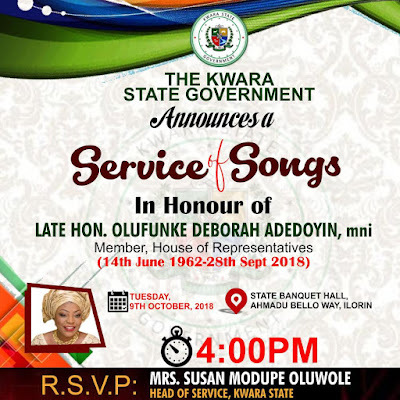 The Kwara State Government is organizing a Service of Songs as part of the funeral rights for late Hon. Olufunke Deborah Adedoyin, the member representing Irepodun, Ekiti and Oke-Ero Constituency at the House of Representatives who died on September, 28th 2018. 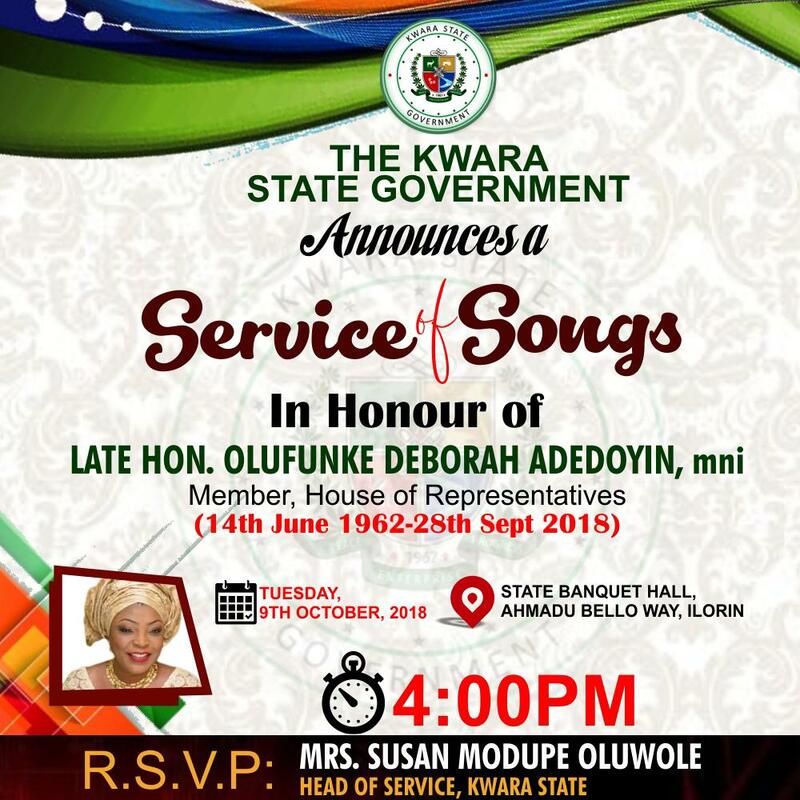 According to the Head of Service of Kwara State, Mrs. Susan Oyewole, who heads the state committee for the funeral, the Service of Songs takes place on Tuesday, 9th October, 2018 at the State Banquet Hall, Ahmadu Bello Way, ilorin at 4pm. The Service of Songs, according Mrs Oluwole, will be attended by the State Governor, Alhaji Abdulfatah Ahmed, members of the state executive council, family, friends and political associates of the late member of lower chamber of the National Assembly. The Head of Service emphasized that late Hon. Olufunke Adedoyin was not only a major stakeholder in the state but also positively touched the lives of many across the state and therefore deserves to be honored by the state government and indeed all citizens and residents of the state. Mrs Oluwole said the Service of Songs is one several activities lined up for Hon. Adedoyin’s funeral, stressing that information on the other events line up will be provided by family of the deceased.